Did you know that non-profits receive an average of 250% more support from smaller business owners than they do from large businesses? Or, that for every $100 you spend in an independent locally-owned Davis store, $68 stays in the community? Compare that to our chain competitors, where only $43 stays in the local community. Every dollar spent in Davis helps to pay for our schools, roads, parks, and city services. Online purchases and those outside of Davis don’t support our community. Davis businesses are more likely to support the same local charities, schools, organizations, non-profits, events and festivals that are important to your family. Our neighbors and friends are the smiling faces at local businesses. Most of what you need can be purchased in Davis! You probably don’t need to leave town or go online to get what you need. Think local first! Search DavisDowntown.com and the DavisChamber.com for the products and services you need. Davis businesses are more likely to hire locally. Local residents often know more about the products they are selling and take more time to get to know customers. 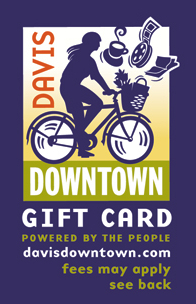 Shop Davis to create more jobs for local residents and have a better shopping experience. Davis businesses, schools, attractions, and events help grow our tourism industry and make Davis…Davis! Businesses and skilled workers are most likely to invest in the community. Shop in Davis to reduce air pollution. With each purchase made close to home you make an investment in our local economy, save time, and reduce your carbon footprint. We are a collaboration of eclectic and unique independent merchants committed to a triple-bottom-line of economic, social and environmental sustainability in Davis, CA. By investing in local businesses, local businesses are more equipped to invest in YOU!